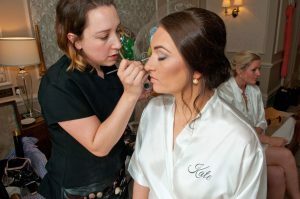 It was all about contour and big eyes for these Yorkshire Lases back in April for Hayleys wedding at Down Hall in Essex. 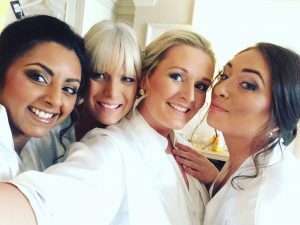 With a ‘go big or go home’ attitude these beauties wanted to make an impact with their wedding day makeup. The look perfectly matches their big and bubbly personalities. Opting for big smokey eyes using my Charlotte Tilbury palletes ‘uptown girl’ and ‘Dolce vita’ depending on the girls eye colour and skin tone – learn more here – http://www.charlottetilbury.com/uk/products/makeup/eyes/eyeshadow.html. I can’t rave about these enough!! For their foundation they opted for the staying power of the Airbase airbrush spray foundation which really does give a flawless finish that lasts all day ( you can find an airbased trained artist near you here – http://www.airbasemakeup.com/airbase-near-you/airbase-professionals). I always recommend this for my brides especially if they like a boogie as it’s extremely water resistant and i’m yet to find another foundation with such great staying power but still looks light. It’s build able though if you want a more dramatic finish like these girls did.